When it comes to hunting, having the best gear is one of the essential things. 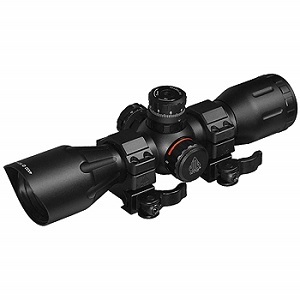 This entails having the best crossbow scope and right hunting cloth among others. Investing in a good scope will enable you to have a good clarity and crisp images while in hunting. A good quality scope should have advanced features which will enable you to acquire a target and make a perfect shot with ease. A scope will improve your field of view, vision in low light situations and also reduce glare in stray light. When choosing the right crossbow scope, it is good to take into consideration factors such as the quality, the type of hunting and the price. 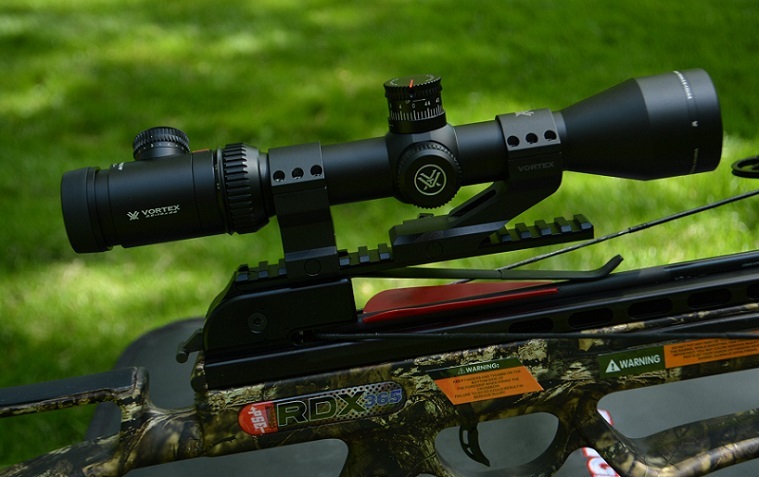 Here are the best crossbow scopes based on real users, design, quality, dimension, and magnification. This crossbow scope from Nikon has a great design which features bright multicoated 3x optics, 3.4 inches eye relief, large ocular and quick force eyepiece. The large ocular enables you to have a wide view while the quick focus eyepiece comes with -/+4 diopter adjustment which ensures that you make a perfect shot. The fully multi-coated layers allow the user to enjoy maximum brightness, light transmission and contrast up to 92 percent. This cope has a 150 MOA adjustment range and a precise of a 1⁄4 inch at 20 yards. The Zero-Reset turrets enable you to sight-in, lift the adjustment knob, rotate it to zero and then re-engage at 20 yards. The field adjustment is as simple as dialing in the subsequent ranges and is parallax-free at 20 yards; thus enabling you to have an optimum accuracy. This crossbow scope also features a lightweight, compact design which is waterproof, shockproof and fog proof. It usually comes with Nikon windage, lens caps, and elevation caps. Nikon 8461 is 8.1 inches long, and at the widest point, it has a diameter of 2 inches. It weighs 11.2 ounces; this means it adds about one pound to your overall crossbow weight. It also has a 3X magnification which enables the user to zero in on the target even in 60 yards away. 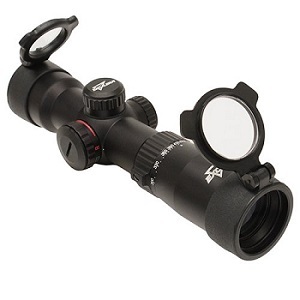 This ultra-compact Tact-Zone is one of the ideal scopes which feature the new updated reticle design, red/green rheostat illumination, 30 mm tube and a multi-coated lens. The fully multi-coated optics enables the user to have exceptional clarity even in adverse weather conditions. The rainwater floats away, and the nitrogen-charged barrel in this scope prevents the occurrence of fogging. At 20 yards, this model features the 4-inch click adjustments for easy sighting in. When it comes to accuracy, Tact-Zone scope has an eyepiece which has a quick focus that enables you to spot your target with ease. It has an etched reticle which is illuminated with red or green, and each color has five levels. The compensation markers enable you to fine-tune your crossbow during the sighting in. Regarding dimensions and specification, this scope measures 13 inches long and weighs less than a pound. It looks great, and the crossbow case fits nicely when mounted on the crossbow. The tube has a diameter of 30 mm and an objective lens of 32 mm optic. This scope also has a variable zoom of 25X to 6X magnification which allows the user to identify the target at a low zoom and to focus on a precision shot. With this model, clarity and resolution are good at all levels thus enabling you to hunt in all conditions. 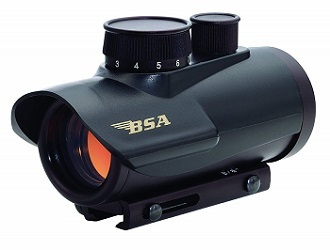 BSA scope has been greatly designed for rimfire, rifles, shotguns, crossbows among others. It features a 5 MOA center dot, and a 3-volt lithium battery which is easily charged when depleted. The brightness in this scope can be adjusted in 11 different ways allowing you to set relative brightness on the dot based on the lighting condition. The BSA scope has the optics which is relatively good. It has an excellent objective lens and a red dot which is clear and crisp. The red dot in this scope is ideal for medium-range shooting. When it loses focus, you simply adjust the brightness down, and the problem will be solved. It has diverse adjustable brightness settings which enable the user to adjust the brightness based on the light conditions easily. This scope is 30 mm wide does not have any specifications. The field of view is relatively good, and you will be able to see a 68 inches area from 100 yards. The parallax setting is at 50 yards; this enables you to spot and bring down the target with more ease. It also comes with 5/8 to 3/8 mounting system which is easily mounted. UTG 4X32 is a crossbow scope which features the 5-step reticle, broadband lens coating, side wheel illumination and a one-inch tube. It has a wide field of view of about 27.2 feet at 100 yards. This enables you to spot and acquire your target with more ease. Mounting of this scope is also easy especially if your crossbow is Picatinny rail or standard weaver. 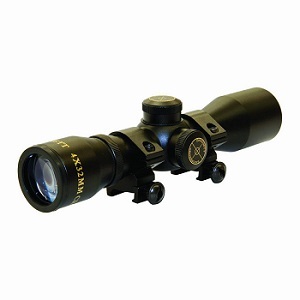 This scope features fully multicoated optics or the broadband lens coating. The reticle has been designed well with brightness settings. It has a 32 mm light transmission which is excellent in low light conditions, and you can configure the illuminations to either green or red. This scope uses 2 CR2 batteries, always make sure you charge fully or carry a spare in case you are doing low-light hunting. This scope weighs 123 ounces and measures 8.19 inches long. It has the standard one-inch fare tube with a width of about 1.65 inches at the sunshade end. The objective lens is made of 32 piece mm piece of glass and eye relief of 3.8 inches. This scope is also designed to have a parallax free at 50 yards. This is a scope which features multi-reticle crosshair and five-point system for quick target acquisition. It is water resistant, shockproof and compatible with most of the crossbows. It usually comes with 0.875-inch mounting rings. 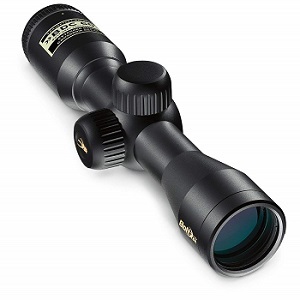 The optics in Barnett scope is multi-coated; this makes this scope resistant to glare and reflection. It gives excellent contrast and image quality compared to similar scopes. The multi-reticle design allows a user to shoot at different yards which include 25, 35, 40, 45 and 50. In poor light conditions, this scope still gives images which are clear, crisp and full of more contrast. This cope has a 4X magnification and measures 32 mm long from the archery gear marker. It weighs 0.8 ounces but usually comes with a shipping weight of 12.8 ounces. The images produced in this scope are also very crisp, clear and detailed compared to the similar scopes. When choosing the best crossbow scope in the market, it is usually good to be well conversant with the specifics. There are red dot scopes which are relatively smaller compared to the optical scopes and requires a battery. The red dot usually doesn’t have the magnifications and transmit simple light. The optical scopes are the ones mostly in the hunting rifles. It offers great magnifications and clarity compared to the red dot. Based on your preferences, always choose the scope which gives you more accuracy and clarity.